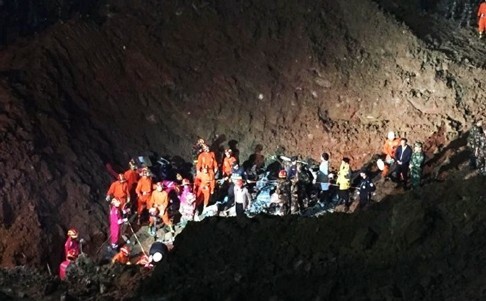 Migrant worker Tian Zeming survived while buried for 67 hours under eight metres of rubble following Sunday morning’s deadly landslide in Shenzhen by thinking of his mother and eating sunflower seeds and grapefruit. He remained conscious throughout his ordeal and defiantly kept tapping with a stone to attract the attention of rescue workers. Tian, 21, told rescuers, after they dug a hole down to just above his head on Wednesday morning, that throughout his ordeal he had kept thinking of his mother and told himself, “I must get out”. 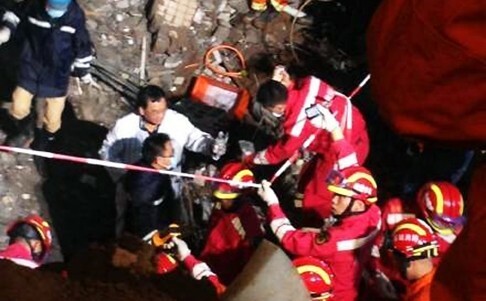 However, it took rescuers another three hours to dig a second hole before he was set free. He said he had been lucky that food, including sunflower seeds and grapefruit, fell into the hole with him after a huge avalanche of mud and rubble crashed into at least 33 buildings at an industrial park in the city. He was one of 76 people that had been reported still missing after the disaster, which has killed at least two people. Tian, who had been partially covered by a door, said he had survived by eating the seeds and grapefruit, but had become dehydrated after being left without water, Shenzhen Special Zone Daily reported. He was also able to breathe fresh air thanks to cracks running through the walls of the building. 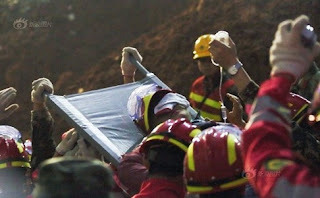 Rescuers praised Tian for remaining determined to survive and frequently tapping with a stone to send signals to rescuers searching through the rubble above. Tian had been “fortunate to escape with his life’ after the building’s walls held firm, officials said. Doctors said he was suffering from multiple broken bones, a crushed right leg, numerous cuts and grazes to his body, plus severe dehydration. He later underwent four hours of surgery, as doctors battled to save his severely injured leg. Wang Guangming, president of Guangming district central hospital, said Tian was now in a stable condition following the surgery. Tian, who had started working for Dejicheng Fine Hardware Company on the industrial estate only about 10 days ago, is so far the first, perhaps only, survivor of the most deadly landslide to hit Shenzhen for decades. He found himself buried eight metres below the surface, alongside a workmate, after the landslide, but the workmate died before rescuers found them. 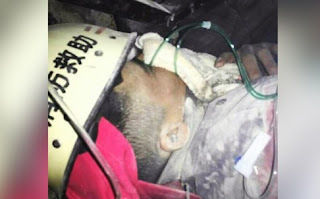 He was first located buried underground by fireman using three separate life detectors at about 3.30am on Wednesday, said Zhou Qiang, the official in charge of the rescue efforts. Workers started to carefully drill holes into the mud and debris that had buried the building. They eventually reached the rooftop of the building after digging an eight-metre-deep hole. “The rescuers saw a hand moving and reported this to their supervisors immediately,” Gao Cunyi, head of Guangdong firemen brigade, said at a press conference on Wednesday morning. Although firemen were able to touch Tian’s hands after digging the first hole, his leg was still trapped by debris, Xinhua news agency reported. Rescuers spent another three hours painstakingly digging a second hole in the unstable rubble so they could get into a small area of the building that had not been crushed and lift the debris pinning his leg. He was given oxygen and an intravenous drip during the rescue, before being taken to hospital on a stretcher. No other signs of human life were detected in the area where Tian was rescued. 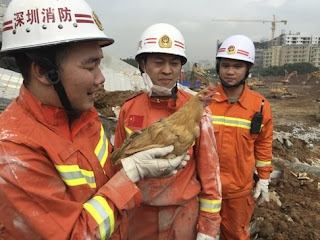 However, rescuers, alerted by sounds of movement, later discovered a live chicken in another area of the site, which had survived under a huge concrete slab that had been buried six metres beneath rubble, Dahe Daily reported. A firemen told the newspaper the chicken would be given a permanent home at the fire station because it represented a sign of hope. Meanwhile, a team investigating the disaster was set up in Shenzhen on Wednesday by the State Council, the chief administrative authority. The team, in charge of three expert panels focusing on land, work safety and disaster relief, is headed by Jiang Daming, Minister of Land and Resources. Senior officials from other agencies, including the ministries of Public Security, Supervision and State Administration of Work Safety, plus representatives from Shenzhen municipal government also form part of the team.